you of your health as he does of bells in the Animal Crossing games. The Animal Crossing games seem to follow the Mario Kart games formula, that formula being where only one game from the series is released per console. Animal Crossing: New Leaf just released for the Nintendo 3DS in the U.S. this week, and is the first 3DS Animal Crossing game. Before jumping to the trailer for the new 3DS game, we're looking at Tom Nook's Wii outing. Animal Crossing: City Folk released for Wii on November 16, 2008. The game was developed by Nintendo's EAD studio, and it received an ESRB rating of "EVERYONE" with "Comic Mischief" listed as content for parents and gamers to be aware of. If you own a Wii, or even a Wii U because of its backwards compatibility with Wii games, you can now get Animal Crossing: City Folk for under $20 as a Nintendo Selects title. How many hours might you expect from the game if you have never played it though? Brew yourself some coffee, and let's take a look at the official U.S. Wii Nintendo Channel data to get an idea! Animal Crossing: City Folk now has approximately 456,147 U.S. Wii owners who have 38,477,386 Total Hours of game-play reported, with about 1,667 days possibly reported. The number of U.S. Wii owners with reported data has increased by just over 150,000 since July 2010, and over 80,000 since May 2011. The Total Hours reported have increased by over 15 million since July 2010, and over 9 million since the 2011. City Folk players have averaged a total 84 Hours 22 Minutes "Per person" of play time with the game, which averages out to be 1 Hour 59 Minutes played per time reported. Its average reported "Per person" has seen an increase of 6 Hours 9 Minutes, from what was reported in May 2011. Wouldn't K.K. Slider be good in Super Smash Bros. 3DS/Wii U? He could have a guitar "smash" special move. 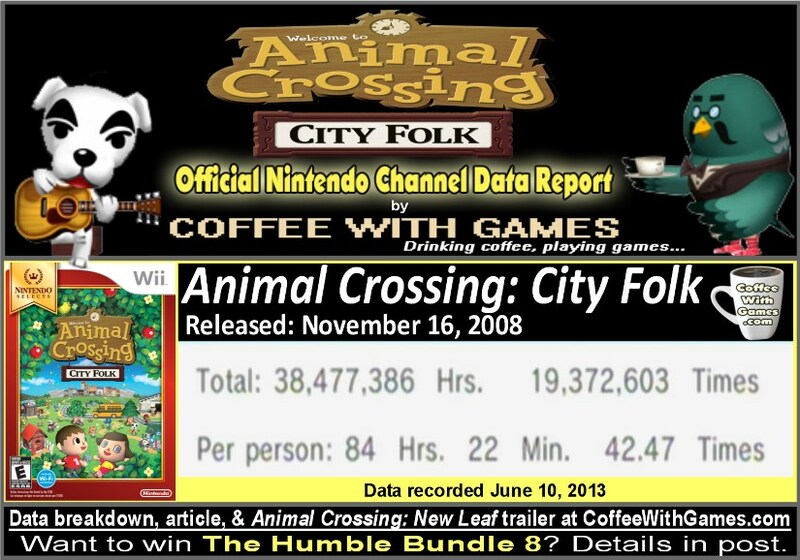 How does Animal Crossing: City Folk's total hours "Per person" compare to other popular Nintendo Wii games? 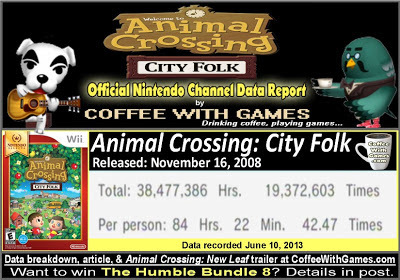 The 84 Hours 22 Minutes "Per person" actually makes Animal Crossing: City Folk one of the Wii's most played games in that category. It has a higher reported average "Per person" than games like Super Mario Galaxy, Mario Kart Wii, The Legend of Zelda: Twilight Princess, and even Super Smash Bros. Brawl! How was the game received by critics and customers though? The game has a "professional" critic review score average of 73.54%, based on 48 reviews on GameRankings.com. Its customer review score average is currently an 82.70%, based on 288 reviews from Amazon.com for both the regular and Nintendo Selects listings of the game. I have said before that I purchased Animal Crossing: City Folk because the bundle that included the Wii Speak microphone was discounted when I did, and I wanted the Wii Speak peripheral to use for The Conduit's online multiplayer. I didn't think I would really enjoy Animal Crossing very much, but was really surprised by it. If Animal Crossing: New Leaf is anything like Animal Crossing: City Folk on the Wii, then it should provide you with many, many hours of game-play fun. 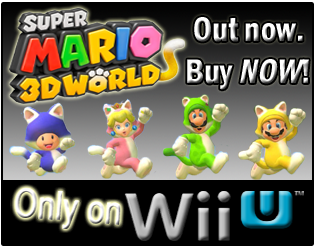 You have the option to buy the 3DS game either in a digital format, or you can purchase a physical copy of it. There was even a recent post and discussion about this, Animal Crossing - the Digital Push, by a guy that doesn't complete very many games. While the digital version might make sense for some, if you base your expected average play time with the new 3DS game, off of the Wii version's reported data, getting a physical copy might make more sense. Why? Looking again at the average time City Folk has been played per session, it's nearly 2 hours per session. I doubt I would care about having another game in my 3DS, if I'm dedicating so much time on one like Animal Crossing. This is the type of game, from my experience with it, that can take over your system and not leave the disc drive/cartridge slot for weeks at a time. We haven't played Animal Crossing on the Wii in a while, and as of now it's in retirement on our game shelf, but Mrs. Coffee does get interested in it randomly, so I never know when it's coming back out of retirement. Also, if you saw the image captions above, it's because Nintendo revealed a new Super Smash Bros. 3DS/Wii U character from the Animal Crossing games today in their E3 Nintendo Direct. I think K.K. Slider, Tom Nook, and even Brewster could be very interesting and fun characters for Super Smash Bros., and knowing how Nintendo is doing DLC in some games now, perhaps Super Smash Bros. will get DLC characters after it releases? 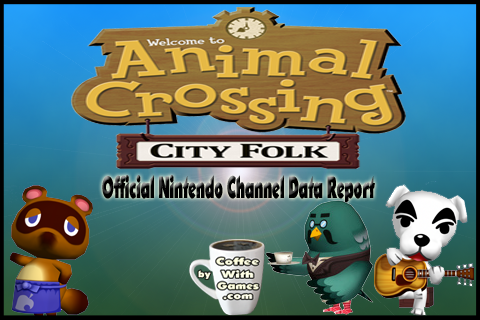 The Nintendo DS game released in 2005, and while the Wii released in 2006, City Folk wasn't released on it until 2008. So, if you're only a Wii/Wii U owner interested in the series, buying City Folk now might make sense when looking at the series' release history. Seeing how much Animal Crossing: City Folk has been played and enjoyed by Wii owners though, makes me wonder if Nintendo will release an Animal Crossing Wii U title, sooner than later. If you're interested in winning The Humble Bundle 8 games, as mentioned in the data image above, simply like this post on Facebook, HERE, to get an entry! Are you a Nintendo 3DS owner that has perhaps recently purchased Animal Crossing: New Leaf for the system? If you had never played the series before, what do you think about it? If you own Animal Crossing: City Folk are you still playing it, or has it been retired to your video game shelf? Man, what a goofy discussion over there on that other site... That is an interesting angle about the sheer time and game taking over your Wii. If that indeed is the case, then cart swapping is certainly less of a factor. Actually I've had GTA: Chinatown Wars in my 3DS/3DSXL for awhile now and haven't swapped it much. Will most likely get the retail version over the next few months if I see it dip under $30. Was also surprised that Newegg didn't have a pre-order offer like many of the other 1st party titles. 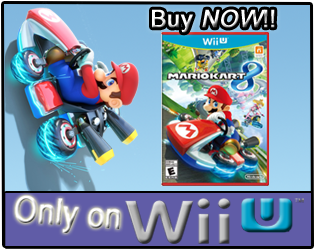 (DKCR3D was $27, others were $10 off like NSMB2) Perhaps the recent price adjustment to $35 vs $39 is a factor? Anyway, maybe you should get a 3DS for some AC:NL action too? "Man, what a goofy discussion over there on that other site..."
Seriously, is the guy like a librarian, "I read a lot of books, as I'm putting them on the shelves...I just don't finish many."? "Am usually not into the various sim-like styles, though this looks like a cool change of pace and some interesting online interaction this time around." "Anyway, maybe you should get a 3DS for some AC:NL action too?" I'll take your old one now, and only charge you $50 for the takeaway and removal fee. Thanks for the comment and feedback, and if I spot if for under $30 on my daily rounds, I'll let you know! Always looked like the kind of fun, time-killer that would REALLY appeal to my daughters, but less-so me, but we have never picked up an Animal Crossing title for whatever reason. Looks like it gets some good mileage though. Do either of your daughters have a 3DS? If so, that might be an excellent future gift (even for your son, who might look at you crazily at first...then when the "magic" hits, everything will make sense). Only my son has a 3DS. My youngest daughter has a DSi and my oldest a DS Lite (she plays the least of all 3). Though, that bit about my son? Sounds like something that could seriously happen. New leaf is about 10x better than City Folk. That's not really a knock on City Folk, but more of an issue of where Nintendo seemingly got lazy and thought they can up-port Wild World from the DS to the Wii and not add enough features to make it worth while. The on-line matching is as clunkly as over and was one area the Wii could have provided over DS. Not being able to bring your town/character whole from the DS into City Folk was also a bummer. It's not a bad game per se, but taken in view of other games, this is a pretty weak and lazy entry from Nintendo. 2) in-game chat is awesome. Can arrange town gate openings that way, and town gate/rail conductor will advise you if someone in your FL has their town gate open if you happen to be trying to open yours. 3) Outside of online connectivity, New Leaf has an auto-updater. Basically a patching system. What is does right now is a mystery, since there's also a separate menu in-game to obtain DLC furniture. But I suspect it will be used for patching larger chunks of content like new characters, events and content. This is should mean the game will have staying power. One problem with both Wild World and City Folk is after the initial wave of people exchanging FC and visiting each other dies down, it gets pretty hard to find people to visit with. You need to go to specialist websites for it, and in most cases, people will turn you down since they don't really know you well enough. So that's another barrier! Get it for the son, The sis might get interested as well. AC New Leaf is pretty gender neutral in that regard. It will actually appeal to girls, without being a girly game. It's just very non threatening and relaxing. Yeah, the online needed some tweaking in City Folk for sure. Fortunately, our neighbors played the game a good bit, so we had them to fall back on if we needed a specific fruit or something. Also, the grass dying in City Folk seemed to be a big issue, has that been fixed in New Leaf? I hope so, while some might enjoy the desert look, it kind of was a pain if you were trying to keep the town looking nice with grass. Grass dying bit is gone. New Leaf is really the Animal Crossing game people imagined the franchise could be. Call off the sub-$30 search, retail copy set to arrive this week. Ah, I'm not going to complete much anyway. :) You're right, she might get hooked on something like this. Good thing I don't have something like a spare 3DS.. I bought City Folk while I was in college, which was a big mistake. I criminally underplayed that game, which kind of saddens me. I don't feel like I really got to experience it properly and all of the new features it had. But now I've moved onto New Leaf and all is well again. I'm absolutely addicted to it. I bought the game Day 2ish (I think I downloaded it Sunday night/Monday morning) and have already put in almost 50 hours. Its currently my second highest played 3DS title and will probably be my #1 by July or a little bit into it. My current #1 champ is Pokemon White 2 with about 70ish hours. I played the GCN version of Animal Crossing quite a bit, but still didn't get too heavily involved in it beyond obessing over getting all the NES games that I could. But I really fell in love with the AC series with Wild World on DS. But yeah, City Folk got retired a little too soon. I only paid $20 for it though so thankfully it wasn't a huge loss. "When I bought that game my family still had dial up internet so if I wanted to play with friends over the internet I'd have to ride my bike to the local McDonalds and connect with their wifi. Good times were had (also played countless hours of Mario Kart DS online at McDonalds XD)." I totally forgot about the Nintendo WiFi USB thing, good to know it did well enough on the game side. No, we don't play Animal Crossing for the Wii much anymore. Time wouldn't work. You might want to see if you can grab an extra Wii Remote and Nunchuk, or maybe a Wii Classic Controller and play some local multiplayer instead with family/friends.